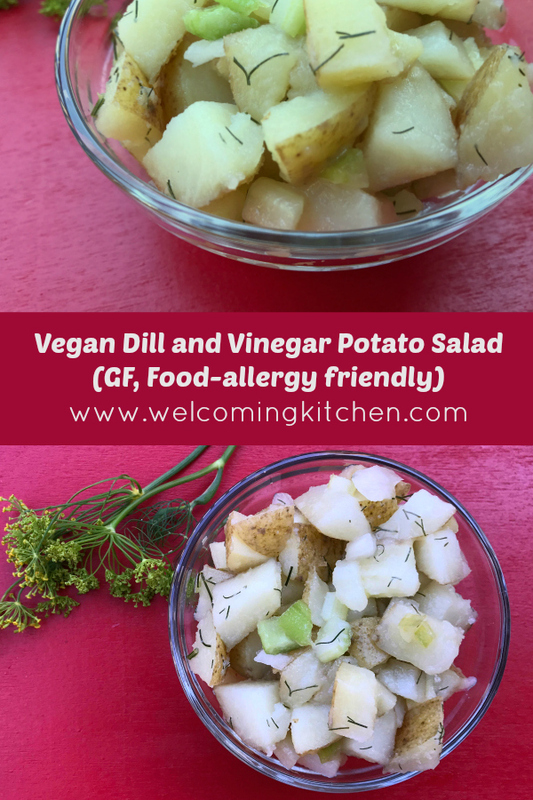 I love foods that are allergy-friendly just by their very nature. Tangy, herb-y potato salad is a great example of a dish that's delicious, but also vegan and gluten-free. I like to steam my potato chunks, so that they are tender all the way through, but still have enough bite to hold up to your fork and not disintegrate into mashed potatoes! Pouring the dressing on the warm potatoes allows more of the flavor to be absorbed into the center of the potatoes, so you get a tasty bite all the way through. Because this potato salad uses a vinegar dressing, instead of mayonnaise, it's safer to pack in a picnic or set out for a barbecue. This potato salad is also a good idea to bring along to a potluck. When you're not sure what else you might be able to eat at a party, it's smart to ensure that you will have at least one food that won't leave you hungry. Steam potatoes until they are fork tender, but still firm, depending on the size of your chunks, this should take between 10-15 minutes. Transfer potatoes to a large bowl. In a small bowl, combine vinegar, salt, and olive oil. Pour dressing over warm potatoes. Mix in dill and vegetables.